I am proud to be among the many Irish and Ireland-based artists from across creative disciplines who have chosen to publicly support the growing campaign of boycott against apartheid Israel. Compared to the imprisoned Palestinian people themselves and to those taking part in flotillas and other perilous anti-apartheid activities in Palestine our contribution and risk may be justly considered small. At most we might lose the chance of lucrative invitations to read, perform or display our works in parts of the US where apartheid Israel’s supporters hold the power of censorship. Departments of foreign affairs and ministries of culture may also not include us among those artists they can rely upon to project a lying image of a harmonious, bon vivant and, above all, harmlessly apolitical intelligentsia. We are sure to be slandered and ridiculed by the hired bullies of the global media empires. The argument that artists should remain aloof from politics does not survive the most cursory of cross examinations. Over the centuries artists have taken every possible political stance both inside and outside their art. They have also performed every possible political action without it having the least negative effect on their own work or on art in general. Indeed, much great art has been produced out of intense engagement with political events and with social movements. One can look up the biographies of the list of Nobel prize winners in literature, or take a stroll around one’s nearest significant gallery if one needs any proof of this. Artistic aloofness in relation to Israel-Palestine is without doubt a political stance, a signal that one will not stand in the way of the strong as they bear down with all their might upon the weak. But to perform in Israel, or to leave oneself open to performing there, is not simply remaining aloof. It is choosing the side of tyranny. It is a decision to ignore the cry of the oppressed. Some artists will make this decision out of ignorance, or because they believe in or are confused by apartheid Israel’s untiring propaganda machine, which is so consciously assisted by the western media and politicians. To these artists I say, take a few days to look behind the headlines, give yourself some time to familiarize yourself with the history of the Israel-Palestine conflict in all of its contexts. Inform yourself properly, and then make your decision. Obviously there are artists, motivated by fame and finance, who will perform in apartheid Israel knowing full well that their actions are an integral part of the war effort against the Palestinians, while of course loudly protesting otherwise. In the long run this may count against them. Their memory will be linked throughout posterity with all those images of rubbled apartment blocks, of old farmers shackled at crossroads, of sad-eyed children dying in makeshift hospitals for lack of basic medicines due to the illegal blockade. Alongside the financial, political and military support of western rulers, the cultural support of western artists is a crucial link in the chain of oppression that tightens every passing minute around the neck of Palestine. Artists occupy a position of public privilege. What we think and feel as it is expressed through our art is elevated above ordinary discourse and seriously discussed at events, in classrooms, and in all kinds of media. Both individually within our local networks and communities, and collectively at a national and international level, we can and do have a disproportionate effect on opinion. We are, I think, perhaps the last significant body of people to enjoy large-scale public trust in most parts of the globe. Added together, what we say and do publicly in our art and in our lives as citizens is reflected upon by many people in a much more profound way than the utterances of most politicians. Our deeds and words ring louder then, and wider, and longer, then those of many others. But so do our silences, our non-actions. That is why both the tacit and the enthusiastic support of artists have been worth so much to dictators and criminal systems like apartheid over the centuries, and why we have been so brutally persecuted when we have refused to give it. All an Israeli major has to do to unwind after a day directing the bulldozing of ancestral Palestinian homesteads is to change into her casuals and head out to see a platinum-selling rock group, or to clap along politely like everyone else is doing at the poetry of some prize-glittering western writer. Then she can feel as refined, as hip, and as justified, as any other liberal westerner. The presence of international artists in apartheid Israel normalizes and buttresses the apartheid system, contributing to its self-confidence and smooth functioning. By performing in Israel, despite the clear call of the Palestinian artists and cultural institutions to boycott Israel, an international artist gives — whether or not they are conscious of it — a signal of approval to the settler-pirates and to the racially brainwashed conscripts who take pleasure in having themselves photographed beaming with national joy in front of blindfolded and humiliated Palestinians. Approval for these and countless other abuses and injustices is exactly how the appearance of international artists in apartheid Israel is interpreted by its politico-military leadership and, crucially, by its rank-and-file soldiers, boosting the morale of those who must implement the bloody practicality of apartheid on the ground. The boycott, if it gained momentum, could have just the opposite effect. It could remove the visage of respectability and normality which the leaders of apartheid Israel so desperately crave in order that they can continue with the dirty work of oppressing the Palestinians unperturbed by the moral opinion of the rest of the world. It could undermine the confidence of the military rank and file and cause significant numbers to question and refuse the implementation of apartheid policies. Above all, it could help to inspire the continuing anti-apartheid resistance of the Palestinian people, and contribute — similarly to how international solidarity with black South Africans did in their case — to the eventual collapse of the apartheid system. To have played even the tiniest of roles in such an outcome would be a greater honor than any prize, review, or invitation is capable of giving us. Dave Lordan is an Irish writer. His latest collection of poetry is Invitation to a Sacrifice (Salmon Poetry, Cliffs of Moher, 2010). The bloody wake left by the Mavi Marmara after the May 31 Israeli commando raid has not deterred 50 female activists from trying to break the four-year-old siege of Gaza. To hear Israeli Defense Minister Ehud Barak speak of their planned relief effort, one would think the very existence of Israel was at stake. It’s important that we understand the number game is just a game. Many colonial powers in the past controlled their colonies through the use of local forces and minimal direct involvement. Those of us opposed the Iraq war should do so based on the guiding principle that foreign invasions, occupations and interventions in sovereign countries’ affairs are a direct violation of international law. It is precisely the interventionist mindset that must be confronted, challenged, and rejected. The news came after a meeting between between Apostolic Nunzio, Msgr Antonio Franco, the sisters and the Israeli military authorities of the area. After construction of the Separation Wall in the East Jerusalem neighbourhoods of Ras al-Amoud and Shayyah, the Israeli army prevented children from the nearby West Bank Azaryah area from reaching their school. 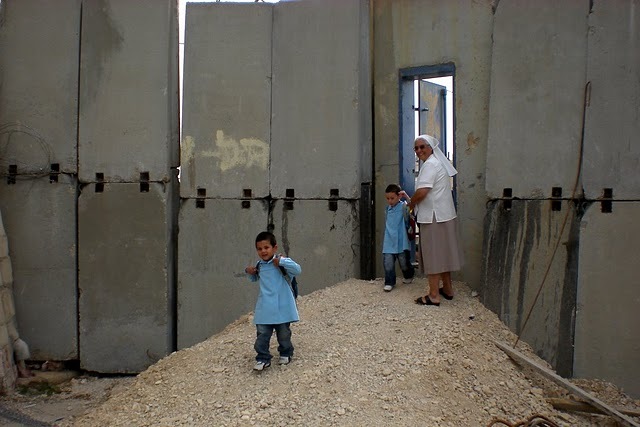 During the last academic year, after pressure by the Combonian sisters who run the school, Israeli military authorities allowed the fifty children attending the school to pass through a small door built in the Wall twice a day, to enter in and go out from their classrooms. The future of the children who will start school in the next few days appears uncertain. If the army doesn’t find or allow another way of access to the school, it will be closed. The children could be forced to make a long 15 km detour by bus, but even this possibility has to be approved by the Israeli army and negotiations are still pending. Recent events testify how education represents a sensitive issue for the Israeli government and army. A few days ago, Israel’s Ministry of Education ordered kindergarten teachers to not attend a seminar on the topic of introducing the Nakba to curriculum across the country. Today the report “Failed Grade. Palestinian Education System in East Jerusalem 2010” issued by Ir Amim and ACRI states that the education system in East Jerusalem remains short of 1,000 classrooms for Palestinian students. As denounced in the report, “despite promises given in legal proceedings from 2001 to build 644 classrooms by 2011, the construction of classrooms has proceeded very slowly. On August 20, the Obama Administration announced that it will reconvene under its auspices direct Israeli-Palestinian peace negotiations beginning on September 2. 1. No more photo-ops, please. There is a desperate need for a just, comprehensive and lasting peace in the Middle East. Negotiations can be a key to that. But the last thing Palestinians and Israelis need are phony negotiations. They only breed disillusionment, resentment, and cynicism about the possibility of Israeli-Palestinian peace based on human rights and justice. So rather than enter into negotiations for the sake of negotiations, the Obama Administration should exert real political pressure on Israel by cutting off military aid to once and for all get it to commit to dismantling its regime of occupation and apartheid against Palestinians, and make clear that the framework for all negotiations will be based on international law, human rights, and UN resolutions. As long as it fails to do so, U.S. civil society must keep up the pressure through campaigns of boycott, divestment, and sanctions (BDS) to change these dynamics and by joining up with the US Campaign to End the Israeli Occupation. 2. The United States is not evenhanded. For decades, the United States has arrogated the role of convening Israeli-Palestinian negotiations. To convince the world that it is suitable to play this role, the United States declares that it is evenhanded, when it in fact arms Israel to the teeth and is aware that Israel will employ these U.S. weapons to conduct its human rights abuses of and apartheid policies toward Palestinians. Under international law, an outside party that provides weapons to a party in an armed conflict violates laws of neutrality. The United States is scheduled to provide Israel with $30 billion in weapons from 2009-2018 (part and parcel of a broader strategy to further militarize the region with an additional $60 billion in weapons sales to Gulf States). The United States cannot credibly broker Israeli-Palestinian peace while bankrolling Israel’s military machine and simultaneously ignoring Israel’s human rights violations. 3. Israeli colonization of Palestinian land continues. In one of its most abject policy failures, the Obama Administration has contented itself with resuming direct negotiations without securing an Israeli freeze on the colonization of Palestinian land, despite spending an initial nine months trying to do so. Israeli colonization of Palestinian land, including the expansion of settlements, the eviction of Palestinians from their homes, the building of the Apartheid Wall, continues apace. Previous failed rounds of negotiations have demonstrated that Israel utilizes negotiations as a fig leaf to actually increase its pace of colonization of Palestinian land, and there is every reason to believe that it will continue to do so. Meanwhile, Israel’s ongoing colonization of Palestinian land creates difficult-to-reverse “facts on the ground” that only make a two-state solution–purportedly the end game of the negotiations–less achievable. 4. Negotiations supersede accountability. The Obama Administration, building on decades of previous U.S. efforts to shield Israel from accountability, has worked actively to scuttle international attempts to hold Israel accountable for its previous violations of international law and human rights, and its commission of war crimes and possible crimes against humanity. Both after the Goldstone Report and Israel’s attack on the Gaza Freedom Flotilla, the United States used its leverage at the United Nations to prevent Israel from being held accountable, arguing that accountability undermines prospects for peace negotiations. On the contrary, for peace negotiations to be successful, Israel must be held accountable for its actions and shown that it will pay a price for its illegal policies. Otherwise, it has no reason to alter its behavior. 5. No terms of reference. In his August 20 press briefing, Special Envoy for Middle East Peace George Mitchell confirmed that the United States is not insisting on any guiding principles for the negotiations, or “terms of references” in diplomatic parlance, and that these terms will be worked out by the parties themselves. In other words, Israel will be free to marshal its overwhelming power to refuse to negotiate on the basis of human rights, international law, and UN resolutions, the only viable basis for a just and lasting Israeli-Palestinian peace. Instead, Israel–backed by the United States–will negotiate based on its own exclusive terms of reference, namely what is in Israel’s “security interests.” As in previous failed rounds of negotiations, Palestinian rights will not enter into the conversation. 6. No timeline. Secretary of State Hillary Clinton believes that negotiations “could” be concluded within a year. Of course, successful Israeli-Palestinian negotiations could be wrapped up within in a year. In contrast to “peace process industry” pundits, there is nothing intrinsically complex or complicated about resolving the Israeli-Palestinian conflict if Israel were to negotiate in good faith by declaring an end to its policies of occupation and apartheid against Palestinians. After all, South Africa concluded negotiations to end apartheid within a few months once the decision had been made to transition to democracy. However, Israel has given no indication whatsoever that it is prepared to alter its policies toward Palestinians, setting the stage for prolonged and fruitless negotiations. 7. Can a leopard change its spots? A recently-leaked video from 2001 shows current Israeli Prime Minister Benjamin Netanyahu arrogantly bragging that “I actually stopped the Oslo Accord [shorthand for the failed 1993-2000 Israeli-Palestinian “peace process’].” (The Institute for Middle East Understanding has provided a useful translation and transcript of the video here.) His current Foreign Minister, Avigdor Leiberman, lives in an illegal Israeli colony built on stolen Palestinian land and has openly declared his support for ethnic cleansing of Palestinians. With this negotiating team in place, how can Palestinians expect even a bare modicum of fairness and justice to emerge from these negotiations? 8. Increased U.S. military aid to and cooperation with Israel make it less likely to negotiate in good faith. In July, Assistant Secretary of State for Political-Military Affairs Andrew Shapiro told the Brookings Institution that “I’m proud to say that as a result of this commitment [to Israel’s security], our security relationship with Israel is broader, deeper, and more intense than ever before.” Indeed, it is. President Obama has requested record-breaking levels of military aid to Israel, and stepped up joint U.S.-Israeli military projects, such as the missile defense system “Iron Dome.” This increased level of military aid only makes Israel more reliant on military might in its attempt to subdue Palestinians into submission, and less likely to negotiate with them fairly as equals. 9. All the parties are not at the negotiating table. Special Envoy for Middle East Peace George Mitchell, who previously brokered a peace agreement in Northern Ireland, when discussing its success often referred to the necessity of having all the parties to the conflict around the negotiating table. What held true though for negotiations in Northern Ireland, apparently doesn’t apply to Israel/Palestine since Hamas, which currently governs the Israeli-occupied and -besieged Gaza Strip and legitimately won the 2006 legislative elections held at the behest of the United States, was not invited to participate in the negotiations. If, by some long-shot, an agreement were to emerge from these negotiations, it is difficult to see how it would be implemented without having Hamas as part of the discussions. 10. Negotiations help Israel mitigate its growing international isolation. Last, but certainly not least, images of Israeli and Palestinian political leaders negotiating presents the world with a false sense of normalcy and allows Israel the opportunity to state that it is making a legitimate effort to achieve peace. With Israel as the party pressing for direct negotiations, it is quite transparent that its desire for these talks has more to do with easing its growing international isolation and defusing the energy from the international movement for boycott, divestment, and sanctions (BDS), rather than with genuinely negotiating a just and lasting peace. This point brings the analysis full circle: advocates for changing U.S. policy toward Israel/Palestine to support human rights, international law, and equality should not be lulled into complacency by the resumption of negotiations, but need to keep up the pressure with campaigns of BDS to change the dynamics that will eventually lead to the possibility of a just and lasting peace. Sign a petition to the Obama Administration, which states that Israeli-Palestinian negotiations must be based on human rights, international law, and UN resolutions to be successful by clicking here. Josh Ruebner is the National Advocacy Director of the US Campaign to End the Israeli Occupation, a national coalition of more than 325 organizations working to change U.S. policy to support human rights, international law, and equality.